The Château d'Angers is situated in the city of Angers in the Loire Valley, in the department of Maine-et-Loire. It is positioned on a rocky ridge overlooking the river Maine. There would have been a fortified structure here in Roman times due to the sites strategic defensive location. The castle is around 600 metres in circumference and boasts 17 massive towers. Each of these would originally have been at least 40 m in height but were later reduced in size to facilitate artillery emplacements. The only tower preserving its original elevation is the Tour du Moulin. It was in the 9th century that the Château d'Angers came under the authority of the powerful Counts of Anjou, and in the process became a part of the Angevin empire ruled by the Plantagenet Kings of England in the 12th century. In the year 1204, largely due to the incompetence of King John, the region was conquered by Philip II (Augustus) and an enormous château was built during the minority of his grandson, Louis IX (referred to as "Saint Louis") in the early part of the 13th century. 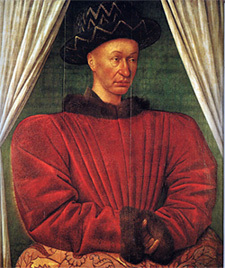 Early in the 15th century, the hapless dauphin who, with the powerful support and inspiration of Joan of Arc would become King Charles VII, had to flee Paris and was given sanctuary at the Château d'Angers. In the early part of the 15th century, Louis II (Louis I's son) and Yolande d'Aragon added royal apartments and a chapel to the complex. The chapel bears the title of sainte chapelle - this being the name given to churches which would enshrine a relic of the Passion. In this case it was a splinter of the fragment of the True Cross acquired by Louis IX. In 1562, Catherine de' Medici had the château fully restored and re-fortified but, her son, Henry III, reduced the height of the towers and also had the towers and walls stripped of their embattlements. Henry III used the stones removed from the castle to build streets and develop the village of Angers. However, under threat of attacks from the Huguenots, the king maintained the château's defensive capabilities by making it a military outpost and by installing artillery on the château's upper terraces. The castle did definitely show its value as a military garrison at the end of the 18th century when during the Wars of the Vendée, its thick walls withstood a massive bombardment by cannons from the Vendéen army. Eventually the invading army simply gave up and not long after, a military academy was established in the chateau to train officers in the strategies of war. It is one of those strange quirks of fate that Arthur Wellesley, first Duke of Wellington who was eventually to defeat Napoleon Bonaparte at the Battle of Waterloo, received his training at the Military Academy in Angers. 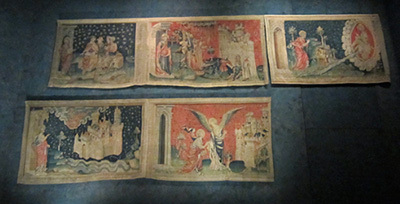 Today, the Château d'Angers is owned by the City of Angers and the impressive imposing château has been converted to house a museum containing the oldest and largest collection of medieval tapestries in the world, with the 14th century "Apocalypse Tapestry", its main priceless treasure on display.